Canon 5D Mark III, 17-40mm f/4L USM at 40mm, f/11 for 13s at ISO 100. I was fortunate to be on a business trip to one of the most beautiful cities in Germany, Heidelberg. The city is in the south of Germany and is a popular tourist destination due to its picturesque city and the castle ruins that overlook it. If you could distill the romantic vision of Germany into one city, that, in my opinion, would be Heidelberg. We were scheduled for two days in Heidelberg to evaluate a company we were considering doing business with, but luckily, the meetings only lasted one day, thus giving me and my colleagues a full day in the city to be tourists. During the day we walked along the Neckar river, strolled through the historic Altstadt, toured the Heidelberg Castle ruins and even took the funicular up to the summit of the Königstuhl which provided spectacular panoramic views of the city. During the evening hours I set off on my own so that I could take advantage of the setting sun to photograph this beautiful city. The above photo was made from the castle overlooking the city. It was taken around 15 minutes after sunset where the light remaining in the sky lit up the clouds overhead. Despite the waning light from the setting sun, I still had to use a 2-stop soft edge neutral density filter to bring down the exposure of the sky to balance with the lights of the city. Prominent landmarks visible in the photo include the Church of the Holy Spirit (center left), The Church of the Jesuits (left edge), the Neckar river and the Old Bridge. Canon 5D Mark III, 24-105mm f/4L IS USM at 105mm, f/16 for 4s at ISO 100. The second photo is of the pedestrian shopping area with the tower of The Church of the Holy Spirit in the background. 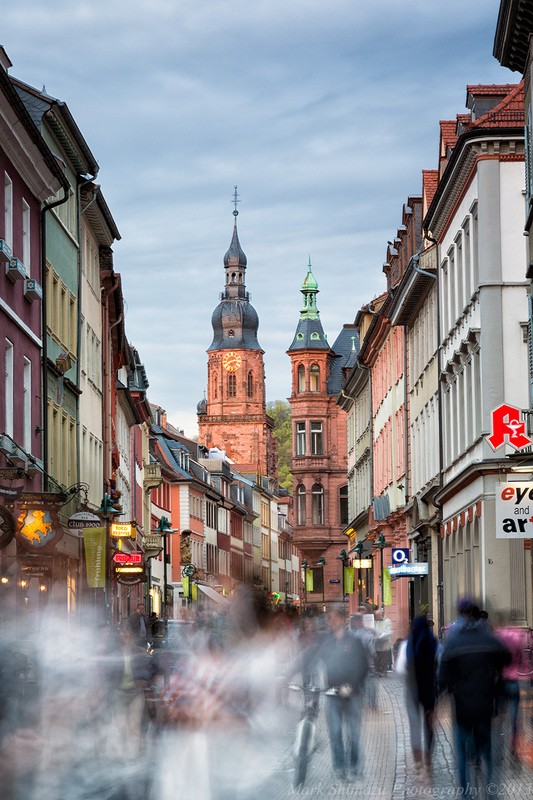 The streets of the Altstadt are paved with cobblestone and lined with charming boutiques along with stores selling everything from gifts to clothing and jewellery. I used a shutter speed of 4s to convey a sense of activity in the busy shopping district which gave motion to the crowd but not so much as to make them indiscernible “ghosts”. Overall the trip was very productive from a business point of view as well as from a cultural and photographic one. Please stop by at the end of the week for Part 2 of the Heidelberg series. Thanks for stopping by evelina. These are lovely cityscapes. You do such beautiful work. Thanks. If you like these please stop by later this week for part II. Wow love the light and composition of the first photo with the city and river drawing your eye up through the whole photo. Fantastic images! The colouring of the cityscape with the sky in the background is wonderful. The movement of the pedestrians adds to the scene well in the second image! Thanks for the informative comment Colin. Wonderful captures of a beautiful city. Great versatility of the camera to handle a 4s exposure in that soft light, it creates a slightly dreamy aspect to the picture and avoids the need to be concerned with having recognisable people pictured in the shot. I was truly blown away by the beauty of this city and was really fortunate to be able to visit while on business. Mark – great set. I love the lighting in #1. The reflections on the river are stunning. #2 is wonderful – blurring the motion of the people gives them a hurried look, which beautifully juxtaposes the two old towers – just great. Cliff, thanks for visiting and for your informative comment. I like your shot along the Hauptstrasse, Mark! The flow of people looks just like what the flow of water at a brook or river would appear in an equally long exposure. 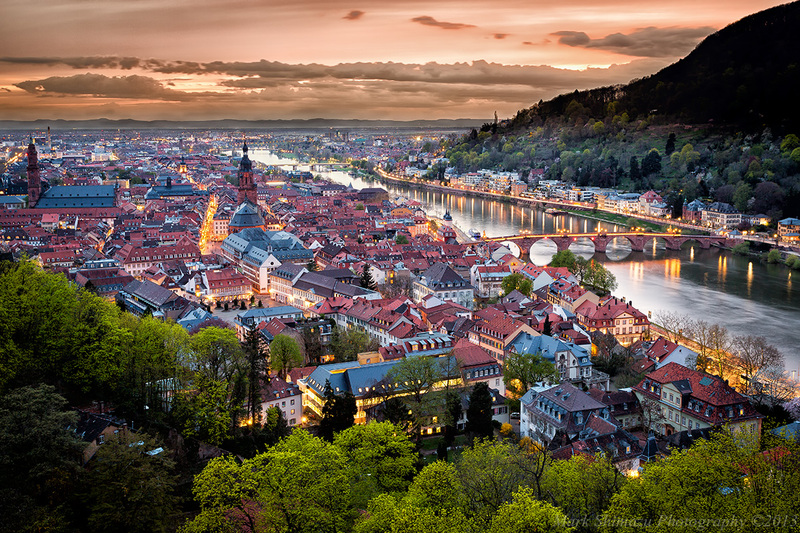 These are stunning shots of Heidelberg! I love the sunset, the night scenes, and the motion of the crowd. You have truly captured the feel of this amazing city. Thank you for sharing! Thanks for stopping by and for sharing your own images of this beautiful city. Great photos of my home town! Thanks Cornelia. I really enjoyed my stay in your hometown.